I will be taking at look at how arts organisations can market to millennials learning from new media technologies. This presentation will examine some of the latest trends in new media marketing and their applicability to engaging arts audiences. It will provide creative industry organisations and entrepreneurs with some tips for identifying and evaluating new media opportunities in their own artistic ventures. The format will include a presentation followed by an active discussion with participants about the new media challenges faced by their businesses. Thanks to the advancement of technology, content of all types is available on-demand via the internet through websites, such as online newspapers, blogs, wikis, video games and social media. These new media deliver content through connection, conversation and community, enabling people around the world to share, comment on, and discuss a wide variety of topics. The creative industries like all other industries have to adapt to the new expectations of audiences who live their lives online. In order to compete for the declining attention spans of audiences, arts organisations and entrepreneurs must adopt techniques proven to be effective in not just capturing their attention, but actively engaging them. 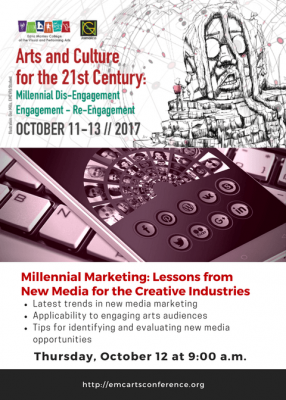 This presentation will examine some of the latest trends in new media marketing and their applicability to engaging arts audiences. It will provide creative industry organisations and entrepreneurs with some tips for identifying and evaluating new media opportunities in their own artistic ventures.